This award is a valuable tool and resource for meeting planners, while also recognizing the hotel sector and the quality of the services offered by the Riviera Nayarit. 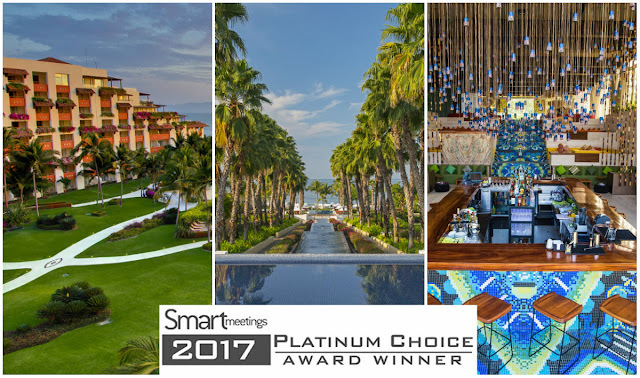 Three hotels in the Riviera Nayarit—Grand Velas Riviera Nayarit, The St. Regis Punta Mita Resort y W Punta de Mita—have been the recipients of Smart Meetings magazine’s 2017 Platinum Choice Award, which recognizes excellence in service and accommodations within meetings hotels and resorts in the United States, Canada, Mexico and the Caribbean. Smart Meetings is considered the top meetings industry resource for professionals, and not only does it recognize hotel properties, it also rewards exceptional service offered by the CVBs and destination marketing companies in North America. The nominations are carefully vetted by the Smart Meetings editorial team, which picks the winners based on ambiance, amenities, breadth of resources, facility quality, guest services, recreational activities, restaurant and dining options, technical support and more. Grand Velas Riviera Nayarit is an AAA Five-Diamond all-included resort that also belongs to The Leading Hotels of the World; it offers impressive surroundings with its gardens, flora, beach and the mountains of the Western Sierra Madre. The hotel has over 2,000 m² of space for meetings including the Grand Marissa Salon with over 500 m², which can be divided into five separate spaces. It also has an additional four salons ranging from 60 to 180 m² of flexible space to maximize productivity and efficiency for meetings. The resort has won numerous recognitions on behalf of Condé Nast Traveler, Travel+Leisure, TripAdvisor, U.S. News and World Report and Forbes; the latter named it one of the Top Ten Coolest All-Inclusives in 2012. The St. Regis Punta Mita Resort promises an experience that transcends the traditional hotel stay, immersing its guests in unmitigated luxury. This is the first St. Regis property in all of Latin America, and offers a service tailored to the most demanding traveler with 120 rooms, special amenities and spectacular gardens. The resort is ideal for meetings and weddings set against an unforgettable backdrop: the inimitable Mexican Pacific. It has eight rooms with capacity for 170 guests and another 500 guests in the exterior areas; for weddings, couples can choose the grand ballroom, a terrace facing the ocean or the immaculate, white sand beach—they are all truly impressive. W Punta de Mita opened its doors in June 2016 as the second W hotel in Mexico and the fifth in Latin America, joining W Mexico City, W Santiago in Chile, W Bogota, in Colombia y W Retreat & Spa - Vieques Island in Puerto Rico. At just over a year since it opened the W Punta de Mita is reaping awards not only for its original design and beautiful facilities, but also the fact it’s become a standard for the meeting planner community. Its Smart Meetings recognition comes in addition to this year’s February nomination as the 2016 Best New Resort in Mexico, Central and South America on behalf of Luxury Travel Advisor’s Awards of Excellence. The RivieraNayarit Convention and Visitors Bureau (CVB) and the Bahia de Banderas Hotel and Motel Association (AHMBB) extend their congratulations to the Grand Velas Riviera Nayarit, The St. Regis Punta Mita Resort and the W Punta de Mita for having obtained the 2017 Platinum Choice Award, which is also an acknowledgement of the hotel sector and the quality of the services offered by this tourism destination. In December the winning hotels will be presented in a press release on a national level and recognized in the print and digital edition of Smart Meetings, reaching over 80 thousand meeting professionals.